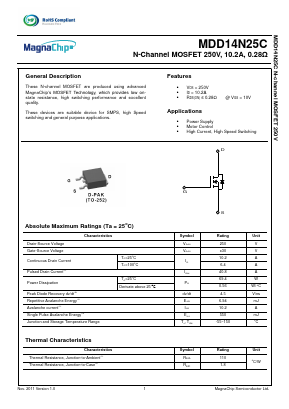 These N-channel MOSFET are produced using advanced MagnaChipâs MOSFET Technology, which provides low on state resistance, high switching performance and excellent quality. These devices are suitable device for SMPS, high Speed switching and general purpose applications. AZ733W DPST MINIATURE POWER RELAY View American Zettler, Inc.
AZ734 DPST MINIATURE POWER RELAY View American Zettler, Inc.
SSD14N25-280D 10.9A , 250V , RDS(ON)280mâ¦ N-Ch Enhancement Mode Power MOSFET View Secos Corporation.